A galactic civil war has lead to a new Dark Age. Thief Thorpe seeks help from a former rebel, now a warlord, and a former general, who wishes to rebuild the Galactic Republic, to save his missing sister Nova from mysterious aliens. 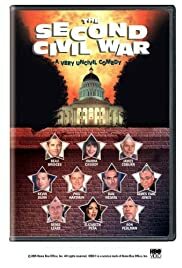 Phil Hartman is hilarious as the inept and waffling President, and Beau Bridges convincing as the Governor of Idaho, in this movie where mistakes and misread news pile up until a seemingly innocuous situation becomes a second civil war. Quite an engaging movie and the ending is one you would not want to miss as well, if just for that few seconds of riotous and comical misunderstanding.